I love everything about the front door to this school — from the logo that looks like mountains reflected in a lake but is also a WV… to the fact that it is ajar and that’s ok.
How do you feel about faculty meetings? My guess is that even if you are an effective teacher and love your job, you dread faculty meetings. You are tired by the end of the school day and don’t want to spend another hour in the building, listening to a bunch of stuff that you could read in an email. Me too. Luckily, I have had some great principals who keep us highly engaged at faculty meetings. Nevertheless, I still feel like have better things to do with my time when that final bell rings, the busses roll, and the loud speaker squawks, TEACHERS, DON’T FORGET THERE IS A MEETING IN THE LIBRARY THIS AFTERNOON. Thus, I was less than enthusiastic when I went to our faculty meeting right after Spring Break. I expected it to be about testing, but instead of the academic counselors handing out rosters and schedules, there was a person I did not recognize chatting with our principal and welcoming us as we entered the library. 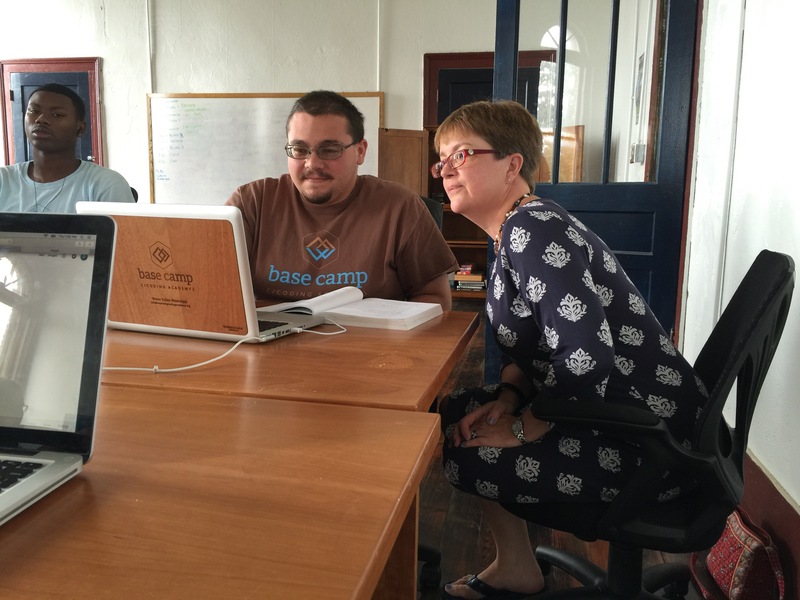 Turns out this tall, thin man is Kagan Coughlin, one of two co-founders of Base Camp Coding Academy (BCCA). BCCA is a newly conceived and fully funded year-long program in Water Valley, a town just 30 minutes south of Oxford, Mississippi. Annually, our state graduates less than 200 computer science majors from its universities, yet there are over 1200 job vacancies in the private and public sector (combined) which require coding and software design skills. As Coughlin talked with our faculty about their mission to train recent high school graduates to write code and develop software in just 12 months, in my head I thought about the student(s) I could nominate. You see, the teacher writes the recommendation first, and then the student might be invited to apply. Everything about BCCA is slightly different than what one might expect. The student I recommended was invited to apply, and he did, and he got accepted to the inaugural class (total 14). I got a chance to catch up with him this afternoon and learn a little bit about what life at BCCA is like. The first thing my former student told me is that they have no homework, but they do go to class daily from 8:30-4:30. 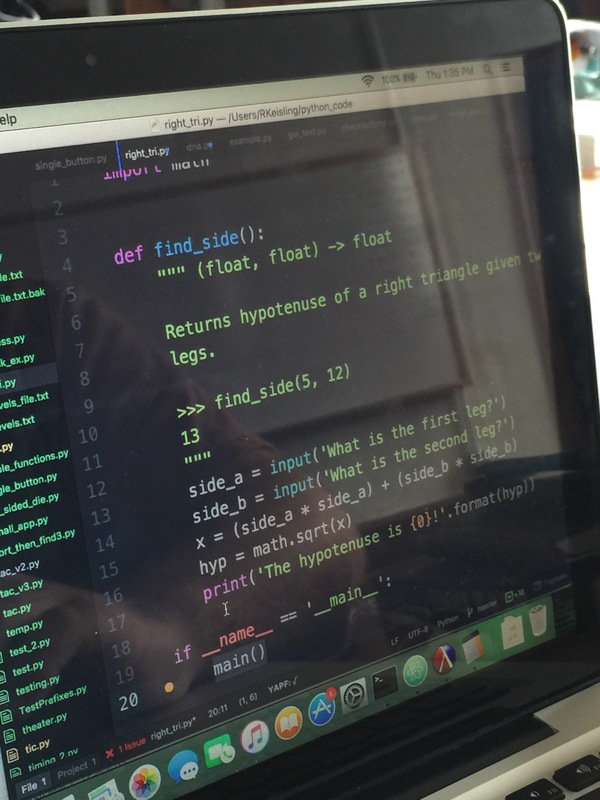 The block I visited after lunch involved students finishing assignments in the computer language they have been learning, Python 3. At this point in their training, they are seven weeks in and mostly finished with learning Python 3, so there was a lot of individual discussion and consultation with the teachers, but not any whole group instruction. The students started June 1st and other than Saturdays and Sundays, they have had no days off besides the Friday OR Monday of July 4th weekend (their choice). In this sense BCCA mimics a real workplace. The students sign in every morning and also indicate their lunch order from the B.T.C. grocery (owned and operated by Coughlin’s wife). [The food is delicious — I was treated to a veggie plate today and later went back down for more tea and a piece of caramel cake on my own dime.] Not your typical school lunch! There is also a ping pong table in the classroom which is heavily used during both lunch and refresh times. After lunch, I sat with my former student as he gave me a virtual tour of some of the things he has learned and written so far. The most complex program was a gladiator game (no animation, just questions about whether to attack or flee and which weapon to use, all with point assignations and random numbers to determine who wins that round). I of course asked him if he could write me a program for finding the missing side of a right triangle given two sides — and he quickly hopped to the task. It was fun to watch his thought process since he assumed I meant “find the hypotenuse given both legs” but I really meant what I said. In any case, as he was writing and telling me what he was doing, we also chatted about other issues. Me: So, when you write a program and someone else in here writes a program, does the code look pretty much the same? Him: It depends on the assignment. For simple tasks, the code will look similar, but when we wrote that gladiator game, our code was really different. Me: Have you talked about how some code might be more efficient than other code? Him: Oh yes. We have talked about that but we haven’t gotten into it for real yet. We wrote a program to time how long a set of calculations would take and some differed by a millisecond. Of course we only had 200 pieces of data. If you have 2 million pieces of data that would be much more important. Him: Ok. Let my just write leg leg for now. Me: OK so you could embed that code into a bigger program later? Me: Have you talked about how in the real world people will tell you what they want and then you will have to ask the right questions to make sure it’s what they want? Him: Oh Yes. That has been a big topic. We have had several companies come in and talk to us plus we went to that big software meeting down in Jackson and in both cases they talked about that. How does this look? Him: Ok. Let’s run it now. Me: I want it to prompt me for the first leg and then the second leg. In English. Him: Ok. I can do that. (tap tap tap) Let’s try it again. Him: A good base in algebra is key to success in coding. Me: What? What did you say? Can I write that down? Me: I am so proud of you. I am coming back in a few months so you can show off even more. Folks, this is where the magic happens. Please share this story, especially with people who can fund this initiative. An anonymous donor funded their macbook pros. Hopefully we can get several of these programs flourishing in Mississippi and bring change not just to individuals who will graduate and walk into lucrative careers, but to their families and to the whole state as well. BCCA is on the second floor of this building, its door ajar and to the right of the umbrella. Upstairs hallway, classroom on the right. Classroom space with wood floors, macbook pros, brick walls and loads of natural light.